Cannibalization. It's a topic that you don't always hear about in retail, perhaps outside of an engagement with a consulting firm, but it's one worth revisiting from time-to-time. As retailers look for avenues of growth, it can also mean that there's an elevated risk that new opportunities will harm the health of existing areas of their business. Should you be looking for the official business definition of cannibalization, it's "the reduction of the sales of a company's own products as a consequence of its introduction of another similar product." In retail there are a couple of ways in which this could happen. It could be online sales cannibalizing in-store sales or one physical location reducing the sales of a nearby physical location. It could also occur when you introduce a new product inside your assortment or have a standalone retail brand in your portfolio that competes closely with an existing retail brand. But there's schools of thought that say it's better to "be on the bus or get run over by it," all of which is to say, is that you have to evolve to adapt to changing customer needs, and if you're not there to grab that opportunity, someone else will get it. We like how Steven Dougherty of Stealing Share said in a Retail Dive article on the topic, "Retailers need to be where the shopper is. They need to be willing to eat their own young if they are to survive and prosper." He's right, but there are ways for retailers to be savvy about how they think about the brands they offer under one roof, and where relevant, multiple retailers under the same umbrella. Perhaps some of the most difficult work in retail is how you position your brand outside of price point. The URBN brands are a solid example of differentiated positioning. Under one group, they have a set of brands which include Anthropologie, for the a mature eclectic shopper, Urban Outfitters, for the youthful, urban customer, and Free People, which caters to a younger and more bohemian profile. With each of them, there's a clear point of differentiation in the product assortment and shopper profile, much of it driven by age or income demographics. At the same time, there's also a subset of their customers who shop across the portfolio of their brands. If you look more closely at their brands, you see one way in which they've gone about differentiating the products between each retail brand in their portfolio is by offering up private labels and exclusive brands that can only be found under that particular retailer's "roof." But that's where some of the most important work comes into focus, which is that even as an individual brand stands alone, there has to be cross-organizational synergies enabling the sharing of information, so that the specific brand's product assortment and pricing don't unnecessarily cannibalize a sister brand's performance. This can also readily apply to a multi-brand retailer considering how much to allocate to each brand and at which price points. With that in mind, let's explore more of what that entails. In this portion, we want to take a few real-world examples to illustrate how you can go about examining if you are putting yourself at unnecessary cannibalization risk. In the first example, we'll be looking at brands within a single retailer's assortment, to understand the price architecture. In the second example, we will use two different retailers, both under the same group, to examine whether or not there's significant overlap in assortment between the two brands. In our first example here, we're looking at men's jeans at a particular department store. We've first broken down their jeans assortment by price bucket. Here you can see the overall pricing structure and at which price point(s) this retailer is most heavily invested. There's some detail here, but we promise it's worth following along. First of all, we can see that the single price bucket where there's the most unique products is $56-60, 31% of the overall assortment. Drilling down further, we can see that there are eight different brands in that particular price bucket. This leads us to an important question, "Is that the appropriate number of brands for a relatively small price bracket?" First, sales data will critically inform us as to whether these are the best-selling brands and price points (which this data would seem to indicate). What's quite illuminating here, is that one particular brand monopolizes the number of unique products in that particular price bucket. When look at the bottom of the infographic, we see that 45 of those 59 products in this price bucket are from one brand. Are these products sufficiently different from one another and is it possible that too many options in one price bucket could harm both the sales of that particular brand and the others in this price range? Let's take a look. Staying within this price band, we checked the stock-out rate of this particular brand, and while four unique products from this jeans brand sold out in the past month, the other brands only sold out one item. This data would indicate that this retailer is likely heavily investing in this particular brand because it tends to sell out at a higher rate than others. On the surface, there doesn't seem to be an issue here, but what we want to illustrate here is this: knowing your pricing structure by brand is key, and then drilling down to what, if anything, materially differentiates each product, will help you maintain an assortment that minimizes cannibalization risk. Are you still with us? 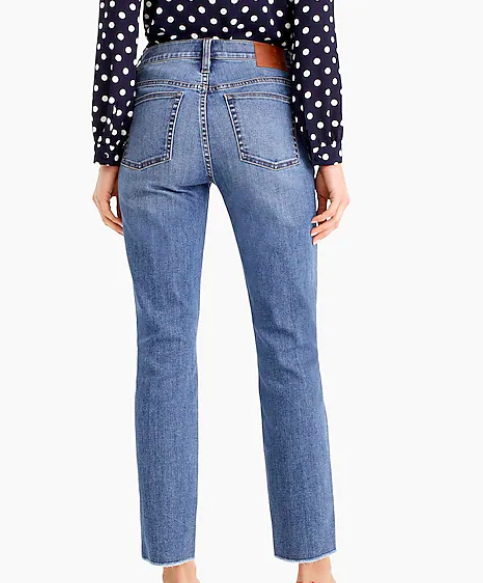 Since we're already talking about jeans, let's use another example to talk about how one parent brand, who has two distinct retail brands under their umbrella, positions their respective women's jeans assortments, to understand if there's any risk of cannibalization in play here. While we can determine some differences in washes, to the naked eye, it's not so different, right? This brings us right back to the point of differentiation. In a world where the customer has tons of choices, and oh yes, they're going to cross competitive lines, how do you make the differences clear? Let's just drive this home with one more analysis. From our first chart, we can see that both retailers have a substantial amount of SKUs between $111-120. So what do two jeans in this price bucket, one from each retailer, look like? Left jean, Original price: $120. Right jean, Original price, $115. Again, while anyone who's tried on jeans knows that small things do of course make a difference, these look remarkably similar. The lesson here? Different imagery, great product descriptions, and promotional and pricing discipline will help your shoppers understand what commands a premium, and it will help minimize the possibility that you're cannibalizing your sister (or brother) brand. Is assessing your cannibalization risk an easy exercise? Not necessarily, but it's certainly a worthwhile one. We hope that these data points, in addition to your internal customer demographics and sales data, give you a start to thinking differently about your assortment. Got questions? Shoot us a message here .